There were many sister groups of the 1920s…but the Boswell Sisters were on a completely different level altogether. Boz Buz – Why Bozzies.com? Three fun, smart, talented and beautiful women singing, swinging and having a ball. That was Martha, Connie and Helvetia (Vet) Boswell and their music is what getting Bozzed is all about. 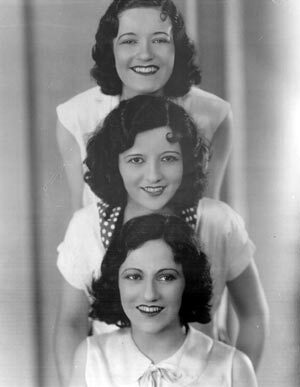 Although the Sisters as a trio only lasted until 1936, their hard swinging, jazz-fortified arrangements of popular songs made them radio and recording celebrities the world over. They quit on top and a stampede of sister acts rushed in to fill the void, most notably the Andrews Sisters. But no one could match their blend, their harmonies or their fabulous creativity. The Boswell legacy was carried on by Connie who continued as a solo performer on radio, records, film, Broadway, cabarets and television through the 1960s. Her honeyed voice, phrasing and flawless sense of rhythm made her the most imitated singer of her era. The Boswell Sisters faded from the popular memory but their music and its joyous, fearless innovations are still fresh today. Listen, learn and let yourself GET BOZZED.